This was such a delicious dinner that A cooked the other night – it was hot, Hot, HOT, and we were dreading turning on the stove to make dinner. 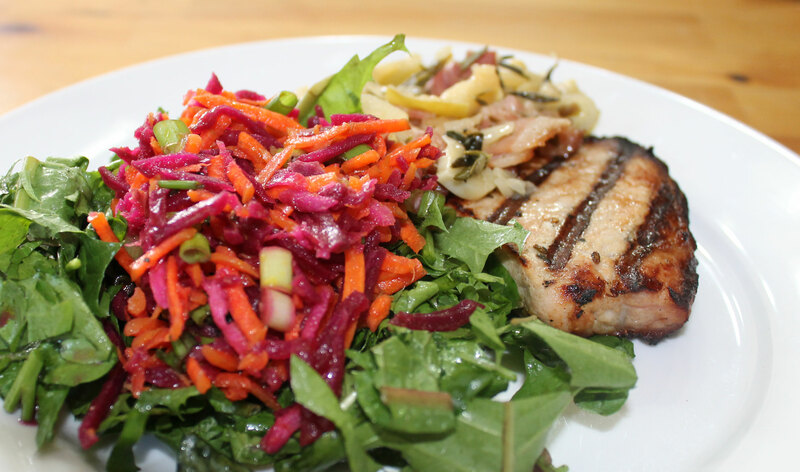 Using the outdoor grill to cook the chops and then serving them with a salad was a no-brainer. This recipe is both Paleo and AIP-friendly if you omit the black pepper. Don’t be put off by the fact that this recipe serves 6 people. 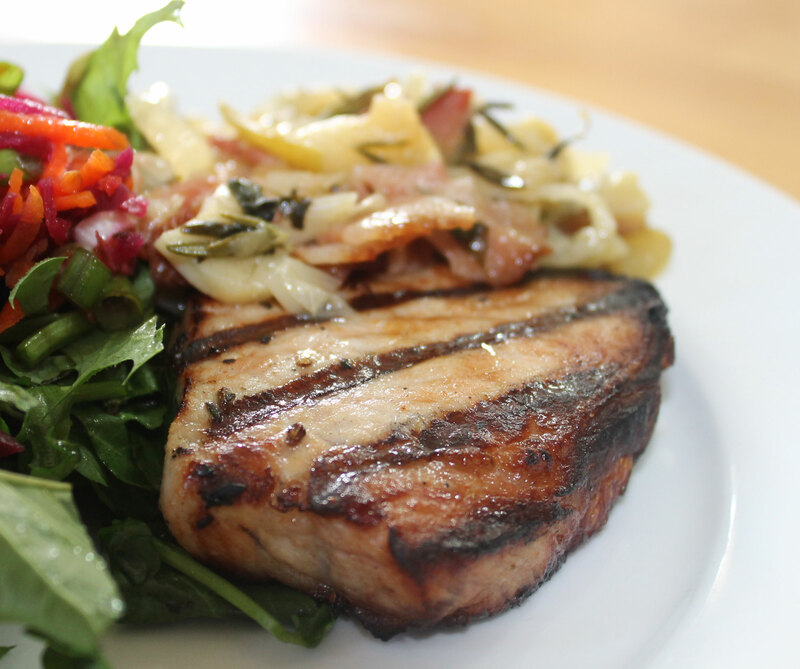 If you need to feed fewer, just use fewer pork chops – one per person is ideal. The apple bacon and onion mixture is also easy to scale down, but I would not bother – it tastes delicious with all sorts of other meats, or even on its own, and is just as good cold from the fridge as it is hot. Preheat your grill to a medium high temperature. While the grill is heating, take the chops and brush them with a little coconut oil. Season well with salt. Place the chops on the grill, and cook for 5-7 minutes on each side until the chops have an internal temperature of 77°C/170°F. If you have got the temperature of the grill just right, you should have some lovely sear marks on the meat. Remove the chops from the grill and keep warm. Now you need to place your cast iron skillet directly on the grill and turn the heat up a bit. Add the bacon to the pan and allow to cook down and release it’s fat. Add the onions to the bacon fat and saute until starting to brown a little. Add in the apples, the herbs and the garlic and cook until everything is soft, and gently caramelized. This should take no more than 5-10 minutes, by which time the chops will have rested. 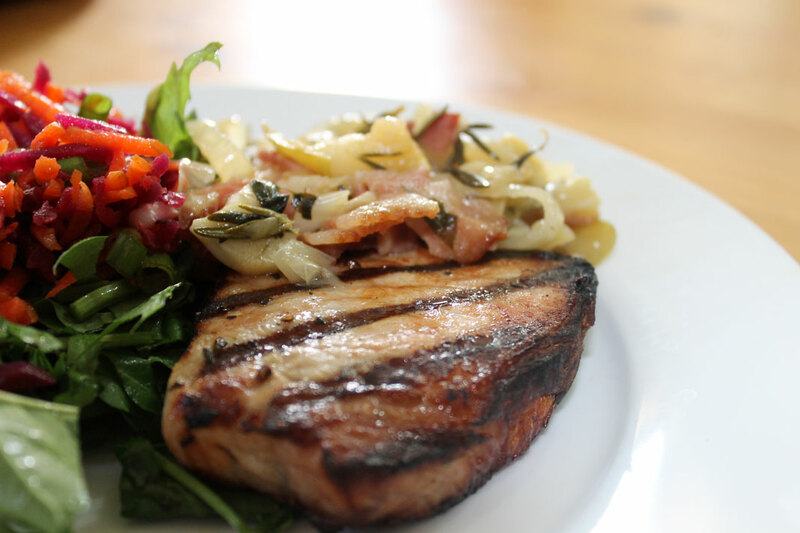 Serve the apple, onion and bacon mixture along with the grilled pork chops. I like to serve this with a brightly coloured salad such as my Lacto-Fermented Beet And Carrot Salad. If you do not have an outside grill, you could easily cook these chops on the stove on a grill-pan. This entry was posted in Autoimmune Protocol Foods, Paleo Autoimmune Protocol, Recipes and tagged AIP-friendly, auto-immune protocol, grilling, paleo, primal. Bookmark the permalink. It was really an awesome delicious dinner. Thanks for posting the recipe. I do love to grilled pork. The garnished looks so cool, gives beauty to the simple dinner recipe.